My wife and I had planned to see this movie for quite some time. As it happened, she was having an event that she had to attend to on the day it premiered yesterday. Luckily it was a public holiday on the following day, so we were able to see the first show at 1.15 PM at the Epicentrum mall. After having our lunch, we arrived at the cinema at almost 1 PM. Well let's get started with the movie then. 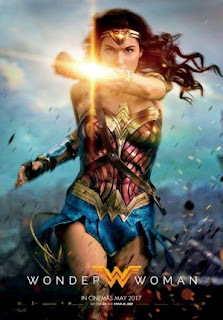 Diana (Gal Gadot - Fast & Furious 6 and 7, Keeping Up with the Joneses etc) was the daughter of Amazon queen Hyppolyta (Connie Nielsen - One Hour Photo, Stratton etc) who had been taught the ways to defend herself by the Amazon warriors leader, general Antiope (Robin Wright - Santa Barbara TV series, Forrest Gump etc) from a very young age. They lived in the island of Themyscira which was hidden from the outside world where the whole island was only inhabited by Amazonian women. One day a US pilot Steve Trevor (Chris Pine - the newer Star Trek trilogy, Jack Ryan: Shadow Recruit etc) fell into the waters near the island after being chased by the Germans. After being interrogated by the Amazonians, Steve finally shared the reason he was being chased and also his intention of informing his findings to his superiors. Diana who felt it was her duty to stop the war insisted on going back with Steve to do so. Both of them ultimately went to London which was a first experience for Diana to be at the outside world. They were met with Steve's secretary Etta (Lucy Davis) who accompanied Diana to buy some new clothes to fit with the modern world. Steve tried his best to convince the British leaders to stop the Germans from using their ultimate weapon. However Sir Patrick (David Thewlis - The Theory of Everything, Macbeth etc) did not really approve it as he believed it would jeopardize the peace that was supposed to be signed with the Germans. Meanwhile, Ludendorff (Danny Huston - Frankenstein, American Horror Story: Coven etc) a German general who was very ambitious truly disapproved the peace treaty. He was cooperating with Dr. Maru aka Dr. Poison (Elena Anaya) to create the lethal gas weapon which could penetrate gas masks and kill people instantly. With the help from a drunk sharp shooter Charlie (Ewen Bremmer - Trainspotting, Jack The Giant Slayer etc), a secret agent Sameer (Saïd Taghmaoui - American Hustle, The Infiltrator etc) and a smuggler Chief (Eugene Brave Rock), Diana and Steve embarked on a very dangerous mission to the "front line" where Diana was supposed to meet with what she thought would really end the war. Well, I think this was a rather different type of DC superheroes movies. This one was felt as a combination of fun and a little bit dark altogether. This movie was telling the origin of Wonder Woman and I think it was told in a very nice way. The earlier part showing Diana since her childhood was quite nice to see (btw I think the child version of Diana was splendidly done by Lily Aspell). What I loved the most was actually the moment when Diana went to London for the very first time. It was truly fun to see the naivety of her in the "man's world" and I think Gal Gadot's portrayal in these scenes were very spot on. What I loved about this movie was also the way Diana evolved from the innocent Amazon woman to what she became at the end. I believe the duration of the movie was just nice even though it was a little bit over than 2 hours. Some might feel it was too long at the beginning but it should not be considered as a flaw. My wife and I really enjoyed this movie. I know she was touched during those emotional moments and I know she loved Gal Gadot portraying Wonder Woman. Chris Pine was charming as Steve Rogers and his chemistry with Gal Gadot seemed very nice. The awkward moments during their trip back to London were very fun to see as well. Steve's allies particularly Sameer was the stand out one. Apart from the fun part, there were also some dark moments and emotional moments as well, reminding us that DC superhero adaptation movies would always have dark tone, but it was not as dark as the other earlier movies. Those of you who prefer lighter tone would definitely be able to enjoy this. This movie was directed by Patty Jenkins who had just 1 movie to her credit prior to this one, albeit a very highly critically acclaimed one titled Monster (with its main cast Charlize Theron won the Golden Globe and Academy Awards). It was a surprise to me that she was able to make the action sequence looked very cool. The special effects was wonderful. The fight scenes were nice. The sound effects were great, especially since I saw this in a theater with Dolby Atmos sound system. The dramatic, emotional, fun scenes were nicely done by Jenkins. All around I think she did a wonderful job directing this movie and hopefully it would bring more audiences to flock the theaters. For those who are expecting to see post-credit scene, be informed that this one did not have any, just like in Batman VS Superman: Dawn of Justice. I guess they did not really want to be seen just like any other Marvel movies? (Although there was some brief mid-credit scene in Suicide Squad). Ooh, one thing though, the movie was categorized as suitable for 13 years old in Indonesia which I thought quite correct since the story was set during the World War 1 which had quite a lot of killings during the war scenes (though it was not the bloody brutal type). In conclusion, I believe this one was a wonderful superhero movie from DC comics. Not since Elektra in 2005 that a female superhero became the lead of a movie based on comic books. Not even Marvel had it in the Marvel cinematic universe. Perhaps after this, they would be making an independent movie of Black Widow? Anyway, for those of you who prefer Marvel comics movies compared to DC comics movies due to their lighter tones, I think this one would surprise you. For those who are die hard fans of DC comics, I am sure you would be coming to see this one anyway. But for those who just enjoy the movies adapted from any comic books, you should be able to enjoy this one. Just watch this and you would understand what I meant.